Description: Flat black connector beam with a hook on each end. The beam has a "Fisher-Price" imprint on the side (measures 3-3/4" long, 1/2" wide). Description: Black 4-1/4" long straight connector beam (measures 4-1/4" long, 1/2" wide, 1/2" deep). Description: Black 4-1/4" long beam with 5 red lights on the top (measures 4-1/2" long, 1/2" wide, 1/2" deep). Description: Flat blue connector beam with a hook on each end. The beam has a "Fisher-Price" imprint on the side (measures 3-3/4" long, 1/2" wide). Description: Flat dark blue connector beam with a hook on each end. The beam has a "Fisher-Price" imprint on the side (measures 3-3/4" long, 1/2" wide). Description: Green (military green) 4-1/4" long straight connector beam (measures 4-1/4" long, 1/2" wide, 1/2" deep). 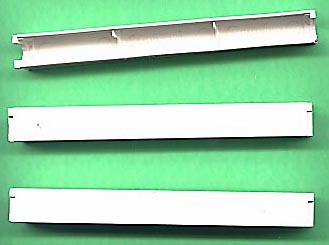 Description: Grey 4-1/4" long straight connector beam (measures 4-1/4" long, 1/2" wide, 1/2" deep). Description: Flat orange connector beam with a hook on each end. The beam has a "Fisher-Price" imprint on the side (measures 3-3/4" long, 1/2" wide). Description: Orange 4-1/4" long straight connector beam (measures 4-1/4" long, 1/2" wide, 1/2" deep). Description: Flat tan connector beam with a hook on each end. The beam has a "Fisher-Price" imprint on the side (measures 3-3/4" long, 1/2" wide). Description: White 4-1/4" long straight connector beam (measures 4-1/4" long, 1/2" wide, 1/2" deep).